Here's a great photograph of one of baseball's most celebrated managers. 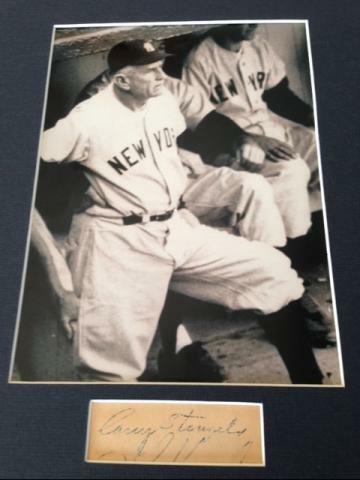 This is an 8x10 framed and matted photograph of Yankees' skipper Casey Stengel - included on the matting is a cut autograph of this Hall of Fame member. 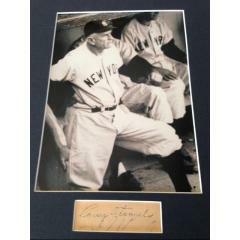 Stengel is pictured in his Yankees' uniform; the team he managed from 1949 to 1960, and won 7 World Series Titles. A Full Letter of Authenticity from James Spence Authentication is included - this photo and signature duo will look great on any wall in your home or office. Yankees fans and collectors of rare signatures will want this one for sure. Get it today for your own. However, due to the rare nature of this piece we will charge your credit card for the full amount immediately upon taking your order. This policy ensures we reserve the item for you. We will confirm your order by Email. Please allow at least 2 weeks for delivery.